In the early 1860s Drury became a base for the British invasion of the Waikato. 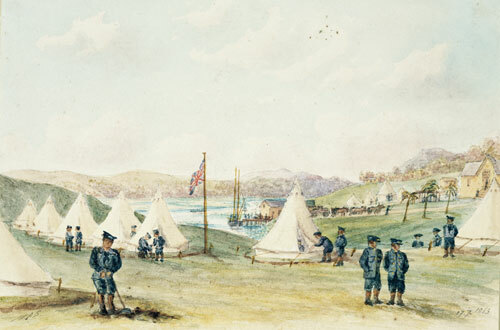 This 1863 painting by Henry Scrivener shows the naval camp of HMS Harrier on the Pahurehure Inlet, Manukau Harbour. Supplies were shipped from Onehunga and then transferred to bullock trains (in the background).